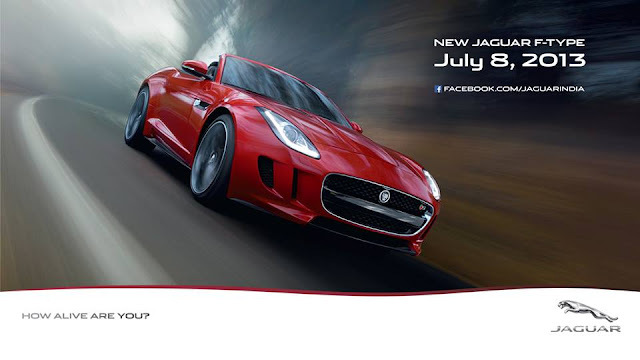 Jaguar India has just updated us via Facebook that the F-Type would be launching in India on 8th July 2013.
aguar F-type will get two variants in India they are V6 S and V8 S. Jaguar F-Type V6 S is powered by 3.0 L Super charged V6 engine which makes 380 PS of power at 6500 RPM and 460 Nm of torque at 3500 RPM. This engine is mated to a 8 speed automatic gearbox. 0-100 comes up in 4.9 seconds and Top speed is 275 Kmph. Jaguar F-Type V8 S is powered by 5.0 L Super charged V8 engine which puts out 495 PS of power at 6500 RPM and 625 Nm of torque at 2500 RPM. This engine is also mated to 8 speed automatic gearbox. 0-100 in 4.3 seconds and Top speed of 300 kmph. Globally Porsche 911, Porsche Boxster and Porsche Cayman S are the direct rivals for Jaguar F-Type. In India too Porsche recently launched Cayman S, hence expect the rivalry to continue. The car would be brought to India through CBU, hence expect the pricing to be in region of Rs 1.25-1.5 Crore.